Another fact: The series is closer than it looks. On Saturday in Bloomington, the Nittany Lions and Hoosiers will meet for the 17th time in a series that began with Penn State’s inaugural Big Ten season in 1993. In one sense, the Lions’ 16-0 head-to-head record speaks for itself, but the scores in a lot of those games tell a very different story. There have been plenty of comfortable wins in that run, but it’s the close games—and the surprising number of them—that stick out. Fittingly, the first was one of the closest. It came at a pivotal moment in the ’93 season. It was Homecoming, the first weekend of November, and at 5-2, the Lions were a bit of a mystery. A 5-0 start had been derailed by back-to-back losses to Michigan and Ohio State, leaving Joe Paterno’s team with a month of games to determine what kind of season it would be. A first-ever meeting with Indiana would be the first test of their stretch run. The Lions passed. Just barely. Writing in The Football Letter the following week, John Black ’62 described it as “a thrilling contest that kept returning alumni on the edge of their cold aluminum benches.” Early on, though, it looked like it might be a blowout. 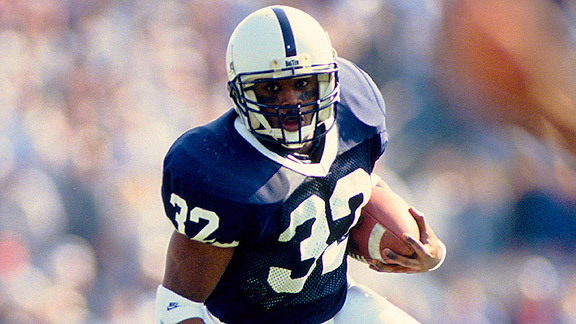 Ki-Jana Carter ’95 (above) ran for a pair of first-quarter touchdowns to help Penn State to a 17-3 lead after the opening period. Then the Thomas Lewis Show started. The IU wideout cut into the lead with a second-quarter TD catch, part of an afternoon in which he finished with a mind-blowing 285 yards on 12 catches, including a 99-yard catch and run early in the fourth quarter. Lewis’ outburst was all the more impressive considering that it came in a battle of the two lowest-rating passing teams in the Big Ten. But the Lions weren’t bad through the air themselves. Kerry Collins ’94, who had struggled for much of the season, completed 18 of 29 passes for 215 yards and a pair of TDs, both to Bobby Engram ’95. The second of those, a 45-yard score midway through the fourth quarter, put the Lions ahead for good. Tony Pittman ’95 intercepted an IU pass in the final moments to seal a 38-31 win. And so the tide of the season was turned. Penn State closed out the season with wins over Illinois, Northwestern, and Michigan State, wrapping up a 6-2 league finish, then knocked off Tennessee in the Citrus Bowl on Jan. 1. Starting with the victory over the Hoosiers, the Lions averaged 35.6 points over their last five games, foreshadowing the offensive fireworks that Carter, Collins, Engram, and the rest of that unforgettable 1994 offense would provide. And the Hoosiers? Not for the last time, they made it a game. This entry was posted in From the Archives and tagged 1993, Bobby Engram, Indiana, Joe Paterno, John Black, Kerry Collins, Ki-Jana Carter, Thomas Lewis, Tony Pittman. Bookmark the permalink.